So there I am, sitting in a quiet booth in the back of a nice restaurant, listening to a friend of mine say one of the craziest things I’ve ever heard. This friend is a highly successful entrepreneur with a gripping personal history. She’s also—and I don’t say this lightly—a gorgeous writer. This self-defeating sentence is hard for me to hear from anyone. But the woman we’re talking about, a born writer with a story and a message that already changes lives every single day? It was truly painful. Lucky for me, she’s forgiving—and she was open to my not-entirely-diplomatic approach. By the end of the meal, we’d both come to the conclusion that writing the book was the right next step in her journey. Writing a book is a dream for so many people. And if you've read this far, I can only imagine you're one of the rare few who's ready to live that dream. So go on. Get in there. Do what you need to do. 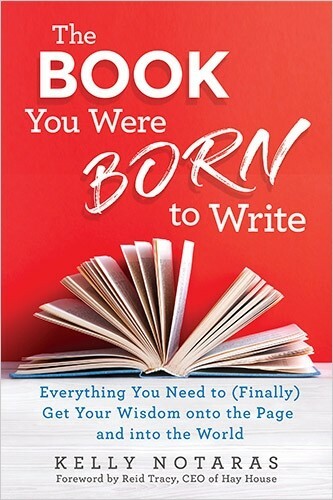 I believe in you - I'm going to show you the way in The Book You Were Born to Write. There are a few really common techniques our clever brains use to explain why we’re not writing. With a little bit of information, the frustrating experience of not writing can melt like ice in spring. What’s needed is the understanding that what looks like a really good reason for not writing is often just resistance in disguise. If you’ve encountered any of the following, you’re in very good company. Perhaps the most common species of resistance goes by the name “not enough time.” Time—we never have enough of it, and we think we need a lot of it. Moreover, when it comes to writing, we think it must be precious and sacred and that candles and essential oils and a full moon need to be involved. Poppycock. The book you’re reading right now was written in fits and starts, 15 minutes here and 45 minutes there. When our writing is flowing, we can’t wait to get back to the computer or journal. We’ll write in waiting rooms, in the queue to pick up our kids from school, and in the last 15 minutes of our lunch break. Writing can happen anywhere, in any amount of time. Unless your world has been completely rocked by an unforeseen disaster—and that happens—“not enough time” is most often a really good 21st-century-approved excuse. Next is the excuse “I need more preparation.” This may be a real thing if you want to write a book about a spiritual approach to dog training and you’ve always been a cat person. So she dropped out of her writing career for five years to get her master’s degree. Meanwhile, her first book continued to sell and sell, with no consideration for the credentials she didn’t have. Sometimes would-be authors think they need training in writing itself. Writing classes are populated in large part by innocent folks who don’t realize they are just biding time. They think they need the class in order to write the book, but often they are using the class as an excuse to not write the book. Not yet, they think. I’m not ready. I need to learn how to be a writer first. While studying the craft of writing is a useful endeavor, it will do you no good unless you’re writing. If you think you need to learn something before you can start writing, take a second look. Could this be resistance in disguise? Another common roadblock I hear about is the paradox of choice. You know you want to write a book; the problem is you have too many ideas. “Which one should I write first?” I’ve found that in most cases, you know exactly which one you should write. The issue is that the right book is the scary one, the exposing one, the vulnerable one. There’s often a cover story that a different book would be better received in the world, but in truth, it’s just too vulnerable to write the book that’s calling most strongly. Anytime the thought of writing pops up, it is immediately wrangled to the ground by the insistence that there’s something more important that has to happen first. Here’s the thing: the to-do list never gets finished. And by the way, while you’re procrastinating, other writers are tap-tap-tapping away at their books. Don’t you want to join them? Quick Quiz: Bad Timing . . . or Resistance in Disguise? Regardless of the flavor of your particular writing crazy, the excuses reasons most writers have for not writing fall under two different categories. The first one is your basic case of writing resistance. The second is an actual problem we call bad timing. Many writing teachers will tell you there’s no such thing as bad timing. They’ll say that if you want to be writing and you’re not, it’s the evil machinations of resistance at work—always. As well-intended as such blanket statements may be, I don’t think they’re true. In my experience books get birthed on a schedule. If your due date is long past, you know it. But it’s also possible that your due date is just not here yet, that your literary baby is gestating for good reason. The key then is to know the difference. This quiz will help you discern whether the delay is bad timing or garden-variety resistance. Just answer “true” or “false” to each of the following questions and then check the key to see if your deferral is legit—or not. 1. True or False: I know what kind of book I want to write, I just can’t seem to find the time to write it. 2. True or False: Whenever I do make it to my computer or notebook and write something, I feel like the writing flows. 3a. True or False (answer only if writing straightforward memoir or fiction): The story I want to write is complete; it already has a clear beginning, middle, and end. 3b. True or False (answer only if writing prescriptive nonfiction or teaching memoir): I feel really solid about how I’m going to structure the process, lessons, or guidelines in the book. 4. True or False: I feel like I could write this book with my hands tied behind my back if only I would sit down and do it. 5. True or False: I worry that some people in my life aren’t going to like what I’m saying—or what I’m saying about them—in the book. 6. True or False: I’m clear on the genre of the book I’m writing (prescriptive nonfiction, memoir, fiction, poetry, children’s book, etc.). And, if I have multiple book ideas, I know which one I’m writing first. 7. True or False: There’s a firm deadline by which I want to have a book or book proposal completed in order to take advantage of a particular opportunity (a writing contest, important holiday, major speaking gig, etc.). 8. True or False: I’ve always had this hunch that I’m supposed to write a book someday. 9. True or False: I definitely spend a chunk of my free time scrolling through Facebook or watching Netflix when I could be writing. 10. True or False: I’ve written part of my book, but every time I go back to it, I read, edit, or criticize what I already wrote instead of writing the next section. 11. True or False: If my kid, partner, or boss needed my help for an extra half hour a day, I would find the time, no matter what my day was like. 3–5: Sounds like you’re almost ready to kick the writing into gear—but the timing may not be quite right. Still, it’s never too soon to strategize how you’re going to get this book written. Did you create that personalized writing plan in Chapter 1? If not, now may be a good time to get your intentions down on paper. 6–8: Hmmm . . . the pieces are definitely falling into place. You know what you want to write about, so the roadblocks standing in your way are probably more about fear than anything else. Sounds like resistance may in fact have her claws in you. The good news is that you’re in the right place: this chapter is going to give you everything you need to know to see, love, and release the resistance that’s standing in your way. 9–11: All your little writing ducklings seem to be in a row, so I hate to break it to you: it sounds like you’ve got a serious case of resistance. No shame, my friend. What’s standing in the way of your book dream is probably a really important but unconscious fear that came online when you were super young. Read on to learn much more about how resistance works and how you can unwind the hold it has on you, starting today. It’s time to have a good, solid sit-down chat with your inner critic. As I mentioned earlier, I call mine Hank. But in truth Hank is just a front—he’s a cover-up for the toddler version of Kelly, who has been secretly running the show. So keep in mind throughout this exercise that the character you’re speaking to is actually a version of yourself, one who’s younger than four years old. Try addressing this cutie-pie part of you as “the little one inside.” Picture in your head a sweet, innocent version of you at three or four. Then step into that picture as the adult you are today and talk to this little one the way you’d lovingly talk to a child. Thank the little one for his invaluable service, letting him know he is seen and appreciated. Then gently begin to educate this younger version of you about your writing dream. Explain the good things that will come from writing this book, whatever they may be: a sense of accomplishment, a boost in credibility for your business, a dream fulfilled. Ask the little one what fears are coming up and then talk them through. Making contact between the adult version of yourself and the little one within is by itself a huge step in the direction of positive change. Simply becoming aware that there are different parts of you— and that these parts have been secretly making decisions about your life all this time—can open the door for more choice. Take the 20 minutes or hour when you’re, ahem, not doing the writing you said you wanted to do. Sit down, breathe, and introduce yourself to the best friend you never knew you had. “Hi, resistance. First, I just want to say thank you. “I see that you have been protecting me for many years. I’m here to tell you that your work is working! You’ve kept the gates locked up tight, and I can confirm that I am still alive! You’ve been doing a great job. “That said, we need to have a talk. See, there’s this book I’m supposed to be writing. “I mean, I’m not really the one who’s writing it. It’s kind of—well, it’s kind of Life. Or whatever. God? The Universe? Anyway, it needs to get through the gate. “So in exchange for you letting me write this book, I’m going to offer you some high-octane TLC. I’m going to attend to you for a change. I’m going to ask you to tell me what kind of attention you would like. And then I promise to listen for your answer. “Maybe you like prayer. If so, I will say a little prayer for you every day. “Maybe you like gestures of appreciation. In that case I will [light a candle for you, sing you a song, take you on a walk] every day. “Perhaps you’d like me to put a little card with the word ‘resistance’ on my altar, so you feel seen. If so, I will gladly adorn the card with several pink hearts in your honor. “And of course I would love to add you to my daily gratitude list. You know, for keeping me so safe lo these many years. “Because you’re amazing at what you do. Then one morning, just as the birds are starting to sing outside your window and dawn is opening into day, listen for the sound of a rusty gate swinging open. And soon after that, for the tiptoe of your writing inspiration, announcing its return. For once your resistance knows that it’s loved, it’s safe, and it will always belong, it will melt into the warm embrace of your deepest desire. Resistance is not the enemy; it’s deeply a part of you. Trust it, honor it, and learn to love it. Good writing can’t help but follow.